George Kosch started the training today welcoming all new Silver members! We are delighted to see so many new Members and so many returning Members who have rekindled their relationship with Worldprofit. So welcome to all new Members, and welcome back to former Members! George reviewed an article just released: "George Kosch, CEO and Co-Founder of Worldprofit. Reflections and Vision. 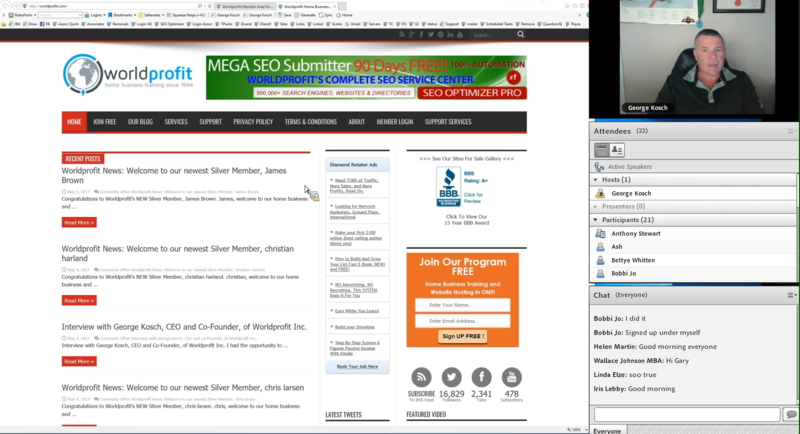 Website Management Software – how to edit your site, how to add pages etc. How to reset your site. NEW! Affiliate Samurai. We have just added a new training course to the Member area exclusively for Platinum VIP Members. Affiliate Samurai is a 10 Part Video Series, a training course for Affiliate Marketers that reveals How Super Affiliates make more sales than anyone else… and how to join them. Access on LEFT MENU under PLATINUM VIP Bonuses. With the addition of this latest course, Platinum VIP Members now enjoy 6 additional intensive training courses on a variety of specialized topics related to growing your online business. Silver members who would like to access these courses, simply upgrade to Platinum VIP Membership to access these and much more. To get an upgrade quote, submit a Support ticket and we will send you the details. Monitor Program. George spent some time reviewing Worldprofit’s Monitor program, what it is, how to get involved. How you can grow your business while volunteering as a Monitor. George revealed the training process, the requirements and the perks you will enjoy as a SR Monitor. We especially need monitors from Europe so we can cover all time zones. You do not need to be perfect. Just be yourself. Be honest, be nice. That’s it. We provide the training. It’s fun! Make friends from all over the world, while learning and growing your own business – and helping others to do the same! Very rewarding and good for the soul. Special Mention: Brad Webb was in the house today! For anyone not familiar with Brad, he is the owner of State of the Art Mailer. Worldprofit has been a big supporter of Brad and his well recognized Safelist for many years. Members can find Brad’s site listed as #1 under Recommended Safelists. and also Buckets of Banners (also owned by Brad Webb) listed at #4 is on our Recommended Traffic Exchanges site. We are hard at work creating some new landing pages for you. Watch for announcements in the Message Center and in the Bootcamp Newsletter. Brian Armstrong made an excellent suggestion, one that will benefit all Members. Brian requested a Banner Widget for the Gold Banner Rotator to be used for easily promoting this commissionable service. George committed to creating this, hopefully this weekend. Watch for a release announcement when ready. Thank you to everyone who attended the LIVE training session today. Keep showing up, bring your questions, your requests for demonstrations and George will keep dishing up good-for you training content to help you grow your online business. George is here for you every Friday morning. The next LIVE training session with George Kosch is Friday May 12th at 8 AM CT / 9 AM ET. Previous Article Interview with George Kosch, CEO and Co-Founder, of Worldprofit Inc.
Next Article Worldprofit Bootcamp Update: Ready for you right now!